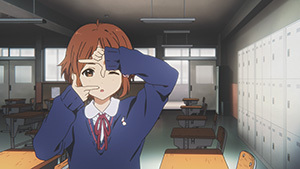 The Tamako Love Story official website posted the first part of an interview with the director of the film, Naoko Yamada, on 2014/03/07. This is a translation of that part. I’ll add the second part to this post whenever it is posted on the website. Thanks to violaxcore for editing assistance. –Let’s start by talking about what you wanted this film to depict. 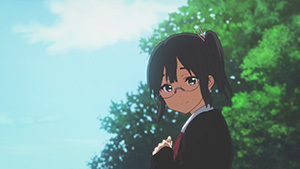 I wanted this movie to show the character Tamako as a girl. This movie could be used to delve inside who Tamako is. I wanted to show her during the time where she’s 17, a fantastic time where the sweet aroma of adolescence is in the air. –So did you choose this theme in order to delve into Tamako? That’s right. Tamako’s mother passed away early in her life, so there was a strong part of her who grew up to replace her mother in the shop. But, rather than becoming a full adult, there were some weaknesses to that process. Therefore she finds herself in the same places looking at things the same way as the other girls. It’s very difficult. You have to take care not to draw her too mature. –How did you decide what the movie would be about? – I want to see that! That may happen. (laughs) The one consistent requirement was that it had to dig into Tamako. If we were to depict a 17 year old girl, then where would her change occur? The school became a focal point. This time, there are a lot of points where the audience will feel the the movie’s theme, love. Personally, I’ve been immensely bothered by the nature of Tamako and Mochizou’s relationship status. (laughs) Or perhaps I should say depicting her as being in love feels taboo…. I thought I might have to tell a dark story to dig into her character. But that doesn’t seem to be the case here. – Because she did fall in love. Yes. It may be a bit rude of me to talk about her in this manner, but she handles love as something unique. I don’t mean pessimistically; a 17 year old girl taking her steps forward in life would surely think that “love” is a good thing, however I was extremely particular about how to to depict a girl that was close to falling in love. Though love itself is an extremely charming topic, it’s something that slowly, bit-by-bit, begins to bud in people in real life as they don’t sense it coming. It was quite troublesome to dig that out. It’s like trying to make a light pink color when mixing paints. Add a little too much or not enough of this color and it’s immensely wrong… Kinda like that. A love story is an immensely difficult challenge. –I see. So what kind of love does Tamako have? 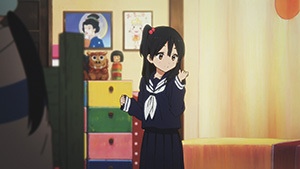 Up until now Tamako hasn’t changed at all in the series, but this time, Tamako has scenes where she wants to be a “mochi-like person.” This movie allows her to relate that concept together with the concept “Hinako” (her “mother”) and come to an understanding. Furthermore, that doesn’t mean that she wants to become a mother, but that she wants to become a woman like Hinako-san and, at that time, the girl named Tamako becomes even more innocent. Tamako is awfully fulfilled during the time she was in contact with Hinako-san. –How were you able to engage those emotions into the storyboards? Tamako is a charming young girl, but because there are some awfully delicate portions in the movie, there were certain scenes that I couldn’t depict. 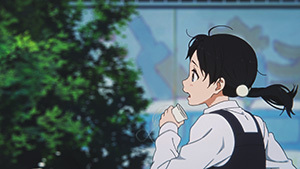 Even when I had meetings with the animation directors, those Tamako parts were the only portions missing from the very start. –How were the animators able to insert her feelings into the images?! It has been quite troublesome for the animation directors and key animators. I’m quite grateful for all the help they’ve been. (laughs) Let’s say the scenes have been pieced together like a puzzle. I was the only person to draw the storyboards this time so perhaps everyone has been patiently waiting on me for the storyboards to go to the next stage…. – They must be frustrated they can’t see inside your head or understand what to draw. That’s a pretty cool way to say something like that. (laughs) Ah, but if you push me, I’d say it’s more the opposite; I’m able to work and feel things from the people around me. I’ll say that’s how I’ll get through every odd and end. But it’s a bit painful for things I’m not great at like math. I have to always consciously be aware of people unconsciously when I direct. –Though the project is diligently in production, how is everyone feeling when working on it? Everyone is working on something in the studio. Right now a certain senior animator would say something like “Everyone read this! I’m too embarrassed to read it!” in order to give everyone a bit of relief. (laughs) There’s many different projects at different points of production in the Kyoto Animation studios. There’s also a difference in the temperature at how each section feels when they’re in progress in a work despite the difference in when they’re released. Following that statement earlier, the staff would writhe in agony reading the scenario. Then I would have meetings with the animation directors, followed by them instructing the animators with my wishes. My “I want to depict this scene this way” atmosphere would be passed down to them. The Tamako team is firey! –You’re able to wrap that passion into the visuals. I was very conscious that this project was a “movie.” I didn’t think about any troublesome topics for the TV series, so it was honestly a fun project to draw. The screen also had that sensation, especially emphasizing a particularly “euphoric” feeling. This time however is fun plus sweet, heartbreaking, and cute. When we put those feelings into the colors and layout, it feels like it unconsciously affects those working on this movie. I wanted to attach a lot of colors to emotions. This time I honestly feel this is made as a “movie.” I think people who watch this film will find it feels lovely. – What did you obsess over when making this movie? An obsession? 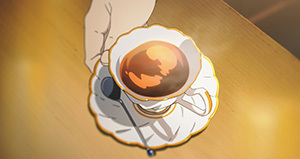 Probably depicting the atmosphere around Tamako and the girls. They were honestly depicted according to the theme in the TV series, but I wanted to depict them inside the world this time. Also there were a lot of layouts I specifically wanted to use a telephoto lens with. To give a kinda love story at a distance feeling. And then I also thought about how to express the characters’ emotions so that the viewers wouldn’t be confused. While each piece is small, I depicted the segments bit-by-bit in sequence not leaving any riddles behind. –As we enter the second half of this interview, please give us some points about each of the main characters. I wanted to tear down the girl she was up until now and depict not just the people around her, but what was important to her as well. 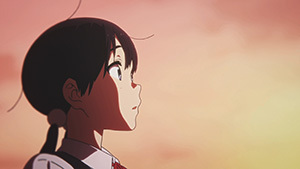 With Tamako falling in love, an area of the world she knew nothing about, it feels as though her horizons have spread. She’s 17, an age where you can easily get carried away emotionally as you pass puberty in becoming an adult. That in itself isn’t necessarily a bad thing. Since it’s something you don’t often see, I wanted to orient this story towards one girl, herself worrying about the future, and have it add a bit of flavor to the tale. He made a big decision this time, which, personally, really made me respect him. People who can make decisions like that are really cool. This time Mochizou is really manly, but there’s also points where he’s as hopeless as ever. She’s a clumsy girl. The most insecure yet an awfully charming girl. Her own feelings are a symbol of the complexity of puberty. I couldn’t take my eyes off her from the very beginning. “What should I do with her?” “How should she act?” But she’s a girl who wants to smile at the end. I wonder if the people who see the film will definitely feel she’s the embodiment of the fluctuations that we feel during puberty. 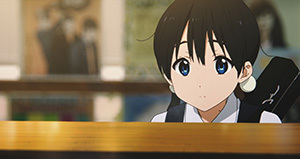 Shiori-san plays a big role for Tamako in this film. She pulled Tamako in with her feminine strength. Shiori-san was able to shed her emotional distance from people in the TV series, so she’s most likely fine as she is now. In a way, she’s like a bird who escaped from her cage. With so many things that make her eyes shine as she looks at them, she’s quite a charming girl. –Please tell us the reason why this film is titled Tamako Love Story. The TV series Tamako Market showed the town where Tamako lives. With this movie focusing on Tamako herself, Tamako’s story, and furthermore having romance as the main point, I decided to title it Tamako Love Story. I tentatively titled it at the scenario stage and used it ever since. This title helped prepare Reiko Yoshida-san to write about Tamako in love, but I also decided to use it so that I too would be able to prepare myself to turn towards her love. I aimed at making this film feel like that kind of absurdity people would love. It’s a fun tale on the southern island. The story itself is comical, so people who watch it should enjoy it. I’m quite happy that Dera-chan could be the bridge between Bunny Mountain and the southern island. The islanders don’t take a single step into the story with Tamako and everyone else in the main feature. 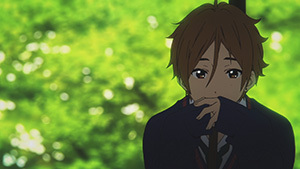 If Dera-chan was beside Tamako, then he could be relied upon whenever one of the characters was feeling down. He’s somewhat of an adult after all. I made this short because, though it was painful to cut them, it felt a bit lonely not to meet Dera-chan or Choi-chan in the film. This short shows a heartwarming exchange upon Dera-chan returning to the island in the south. Our background staff sent out fiery emotions like “I want to go to a southern island… I’ll definitely go once this is done!” We happily made their island full of dreams and wishes from those making it. –Finally, please give a message to everyone eager to see the film once it opens. 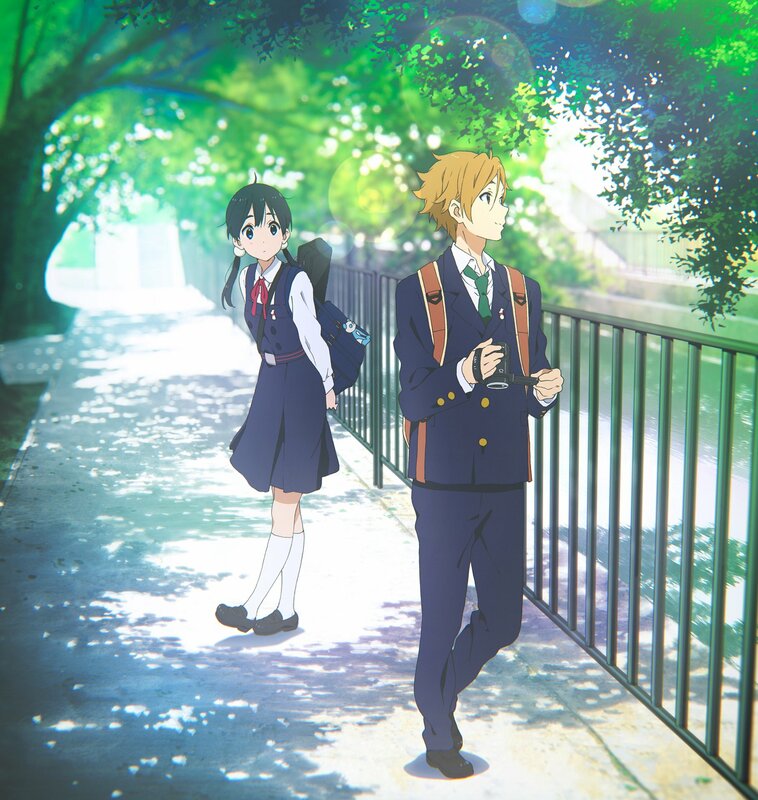 This is a tale about Tamako blossoming, but I think there’ll be many parts that’ll pull at the hearts of the viewers. 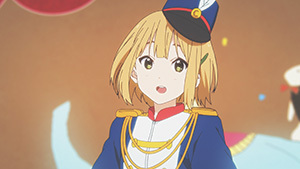 It’s not just about Tamako; Mochizou, Midori, Kanna, and Shiori also bravely move forward in life. I think there’s someone in the film that any member of the audieence could feel a connection with. With spring being such a warm time, I’m truly happy that Tamako and the rest of the cast could meet everyone again at this time. Please enjoy the film. Wait, is Midori going to get snubbed out of this? !